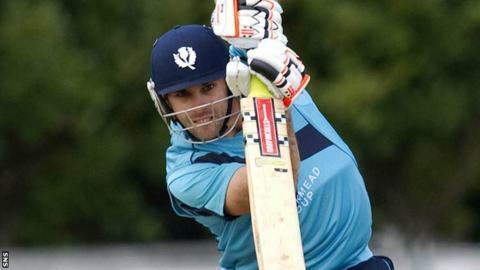 Scotland beat Italy by seven wickets in their first knock-out match at the ICC World Twenty20 Qualifier in Abu Dhabi. Batting first, the Italians set a target of 126, which Scotland reached with 15 balls to spare. Openers Richie Berrington and Calum MacLeod shared a 112-run partnership. The Scots will now meet Netherlands, surprise losers against UAE, on Thursday, where a win would secure a place at a major tournament for the first time since 2009. Kyle Coetzer's side restricted Italy to 125 for eight after losing the toss, with Safyaan Sharif taking two wickets in the first six overs. Neil Carter also took two wickets, while Majid Haq claimed two catches and Sharif ran out Dinidu Marage off his own bowling to put Scotland in a strong position. Scotland, who finished fourth in Group B to set up the play-off, started impressively with the bat, as openers Berrington (52) and MacLeod (56) made significant inroads into Italy's total. Carlo Sandri claimed both openers within three balls but Michael Leask and skipper Coetzer guided the Scots home in the 18th over. Coetzer was delighted with a "good solid performance" and praised his side's bowling attack. "Majid, Sharif, Carter all put their hands up, before we knocked the runs off easily," he said. "Their main player Gareth Berg (24) played a few nice shots, but that's what we expect in T20 cricket. Thankfully Saffy bowled a nice straight one which hit leg stump and we were off and running. "We'll wait to see who wins this afternoon [between the Netherlands and United Arab Emirates] and we'll sit down and see what our plans are." Six sides from the Qualifier will reach the main tournament in Bangladesh next year. Ireland, Afghanistan, Nepal and UAE have already booked their places.